Having started life in 1980, Adairs quickly became Australia’s leading retailer of manchester and homewares. 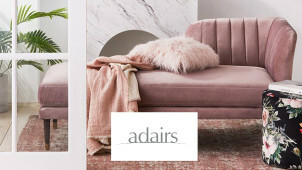 If you’re stuck with a bleak bedroom, bad bathroom or lacklustre living room, rest assured that Adairs is the place to go to get high quality furnishings at a price that fits. For your bedroom, you’ll find bedding, pillows, throws, cushions and much more to create your own haven away from the stresses of the world. Over in the bathroom section you’ll find towels, robes, bath mats and more items to make your bathroom the place you’ve always wanted it to be. Furniture is in good supply too, with chairs, ottomans, tables, bedheads and beyond to give your space the accent and storage you need. If you're not shopping for yourself, Adairs is ideal for giving gifts to houseproud friends and family with its special gifting section. If all that sounds like a bit much then never fear, check out the Adairs blog and the Interactive Furniture Lookbook for some all important inspiration. Check out the sale section for some great Adairs deals! Where is my nearest Adairs store? You can search for your nearest Adairs here. Can I get free shipping with Adairs? Yes, when you spend over $150. How can I pay with Adairs? You can pay with AmEx, Mastercard, Visa or PayPal. You can return your purchase within 30 days of receipt (within 60 days for Linen Lovers members) to receive an exchange or refund. Item must be in original conditions and packaging. Does not include quilts, toppers, protectors or pillows for health reasons). Contact customer services to initiate your return, then post item back with invoice or receipt to: Adairs Online Returns, 88 Atlantic Drive, Keysborough VIC 3173. Items can also be returned instore. Full policy here. Your home is your castle, your sanctuary, your own personal retreat, so decorate and furnish it the way you want with the amazing products on offer from Adairs. Filled with manchester, bedroom co-ords, bathroom accessories and beyond, there’s something here for everyone and shopping with an Adairs coupon code from vouchercloud means you’ll make a saving too. Create a flowing, relaxing home that tells your story with the folks at Adairs today. Ever wondered why it’s called manchester? You’re not alone. We did some digging and found that during the 18th and 19th centuries, settlers were unable to successfully grow their own cotton, so had to import their bedding, sheets and other cotton goods from overseas including from Manchester, England! One of the centres of the Industrial Revolution, Manchester had a huge cotton industry and was even nicknamed “cottonopolis”. The city became synonymous with all things bedding and the name stuck! There’s no point buying the best furnishings for yourself if you can’t see them properly, so invest in some gorgeous home lighting to really set the tone for every room in the house. Order with an Adairs discount code from vouchercloud and you’ll get your premium lighting for less, so you can bask in the glow of your newly illuminated rooms without worrying about the cost. Choose from geometric metal, textured ceramic, modern wood and other styles today!